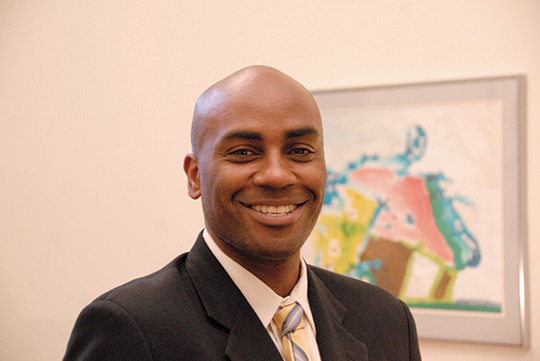 Ernest Morrell is the Coyle Professor of Literacy Education and Director of the Center for Literacy Education at the University of Notre Dame. He was formerly the Macy Professor of English Education and Director of the Institute for Urban and Minority Education (IUME) at Teachers College, Columbia University. He is also an elected member of the AERA Council, elected Fellow of the American Educational Research Association, a past-president of the National Council of Teachers of English, an appointed member of the International Literacy Association’s Research Panel, and convener of the African Diaspora International Research Network. His areas of interest include: The Teaching of English, the African Diaspora, Postcolonial Studies, Media and Popular Culture, and Literature for Children. In 2015, 2016, and 2017, Ernest was ranked among the top 100 university-based education scholars in the Annual EdWeek RHSU Edu-Scholar Public Influence Rankings. Ernest is also the recipient of the 2017 Divergent Award for Excellence in 21st Century Literacies. Ernest has written more than 80 articles and book chapters that have appeared in publications such as Research in the Teaching of English, Teachers College Record, the Journal of Teacher Education, Reading Research Quarterly, English Education, the English Journal, the Journal of Adolescent and Adult Literacy, and Learning, Media, and Technology. He has authored eight books including New Directions in Teaching English, Doing Youth Participatory Research, The Art of Critical Pedagogy, Critical Literacy and Urban Youth, and Critical Media Pedagogy: Teaching for Achievement in City Schools, which was awarded Outstanding Academic Title for 2014 by Choice Magazine of the American Library Association. Ernest has earned numerous commendations for his university teaching including UCLA’s Department of Education’s Distinguished Teaching Award. He received his BA in English Literature from the University of California at Santa Barbara, and his teaching credential, his MA and his PhD in Language, Literacy, and Culture from the University of California, Berkeley where he was the recipient of the Outstanding Dissertation award in 2001. Ernest is chair of the Planning and Advisory Committee for the African Diaspora Consortium and he sits on the Executive Boards of LitWorld and the Education for Democracy Institute. (2018). Educating Harlem: Schooling and Resistance in an American Community. New York: Columbia University Press. (2016). Doing youth participatory action research: Transforming Inquiry for researchers, educators, and students. New York: Routledge. (2015). New Directions in Teaching English: Reimagining Teaching, Teacher Education and Research. Lanham, MD: Rowman and Littlefield. (2008) The Art of Critical Pedagogy: The Promise of Moving from Theory to Practice in Urban Schools. New York: Peter Lang. (2008). Critical Literacy and Urban Youth: Pedagogies of Access, Dissent, and Liberation. New York: Routledge. (2017). The dual pedagogy of YPAR: Teaching students and students as teachers. Review of Education, Pedagogy, and Cultural Studies, 39 (2) 139-160. (2017). Youth Participatory Action Research and Critical Epistemologies: Rethinking Educational Research. Review of Research in Education, 41(1), 311-336. (2017). Overcoming the Digital Divide: Four Critical Steps [Policy brief]. Newark, DE: International Literacy Association. (2016). Critical Ethnic studies in the high school classroom: Academic achievement via social action. In P. Noguera, J. Pierce, and R. Ahram (Eds). The unfulfilled promise of racial equality in education: Current realities and future prospects. New York: Springer. (2015). Teaching English Powerfully: Four Challenges. English in Texas. (2015). The 2014 Presidential Address. NCTE Council Chronicle, 24 (3). (2015). Powerful English at NCTE Yesterday, Today, and Tomorrow: Toward the Next Movement. Research in the Teaching of English, 49 (3), 307-327. (2015). Toward a critical pedagogy of race: Ethnic studies and literacies of power in high school classrooms. Race and Social Problems, 7(1), 84-96. (2015). The council of youth research: Critical literacy and civic agency in the digital age. Reading and Writing Quarterly, 31(2) 151-167. (2014). English Teaching as Teaching Students to Read the Word and the World: A Presidential Commentary. NCTE Council Chronicle, 24 (2). (2014). Critical Action Research and the Future of English Education: A Presidential Commentary. NCTE Council Chronicle, 24 (1). (2014). Toward a Critical Model of Teacher Learning: Lessons from the South Carolina Reading Initiative. Reading and Writing Quarterly, 30 (3). (2014). Cultures, contexts, and codes: An interview with NCTE President Ernest Morrell. English Journal, 103 (4) 12-15. (2012). Linking the Word to the World: Connecting Multicultural Literature to the Lives of 21st Century Youth. The Dragon Lode. (2012). Multicultural Readings of Multicultural Literature and the Promotion of Social Awareness in ELA Classrooms. New England Reading Association Journal, 47(2), 10-16. (2011). Powerful Leadership in English Education. English Leadership Quarterly, 34(2) 14-18. (2008). Rebel Musics: African Diaspora Popular Culture and Critical Literacies. In C. Payne and C. Strickland (Eds. )Teach Freedom: The African American Tradition of Education for Liberation (pp. 222-235). New York: Teachers College Press. (2008). Comin’ from the School of Hard Knocks: Hip and the Revolution of English Classrooms in City Schools. In B. Ayres, G. Ladson-Billings, G. Michie, and P. Noguera (Eds.) City Kids, City Schools: More reports from the front row (pp. 197-207). New York: New Press. (2008). The Critical Uses of Hip-hop in Antiracist Education. In M. Pollock (Ed.) Everyday Antiracism (pp. 161-165). New York: New Press.